The difference between regular chocolate used for making hot chocolate and Mexican chocolate is that the Mexican chocolate discs have sugar granules inside the disc, giving it a rough texture before it melts. You can get a close up look at what the inside of a Mexican chocolate disc looks like in my recipe for champurrado, which is a chocolate atole. 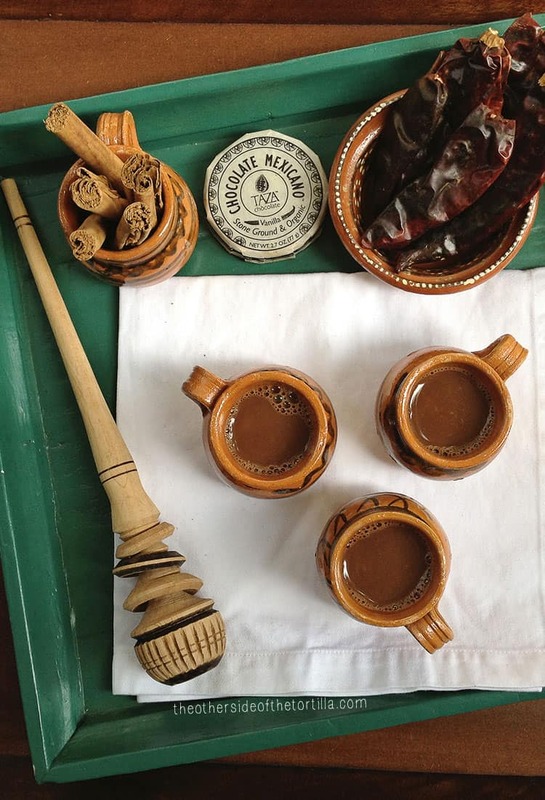 If you’re not familiar with atoles, they differ from hot chocolate because they are thickened with corn masa, while hot chocolate is typically made with milk or water. This version uses whole milk for a thick and rich chocolate caliente; you can substitute 2%, 1% or skim milk if you’d like a version that is a little less rich and to cut calories. 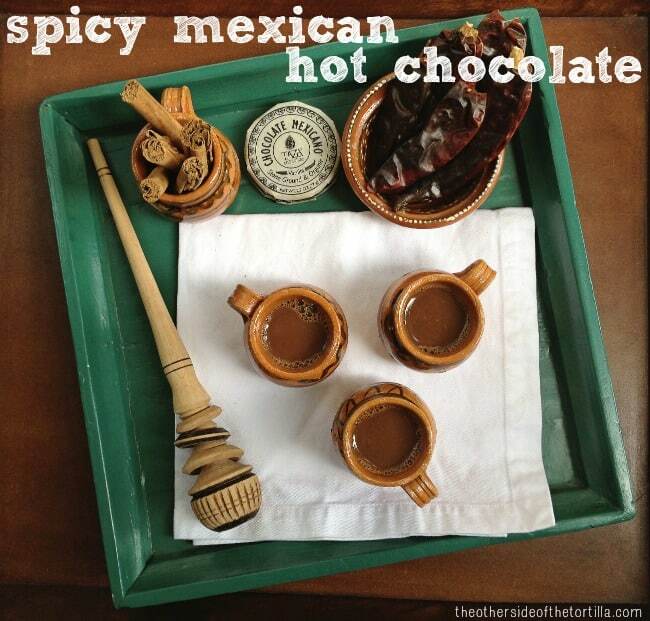 Guajillo chiles lend an earthy, fruity bouquet and a spicy twist on a classic Mexican hot chocolate recipe. In a saucepan, add 2 cups whole milk, 1 chile guajillo and 1 Mexican cinnamon stick. Stir to submerge the chile and the cinnamon stick. Warm over medium-low heat for about 10 minutes, stirring frequently. Chop the chocolate disc into very small pieces. Add to the saucepan and stir with a whisk or molinillo to incorporate the chocolate. Continue heating for another 5 minutes, stirring frequently. Pour into a heat-safe pitcher and serve or ladle into small mugs. This recipe includes affiliate links to my Amazon aStore, El Mercadito, for the brands of chocolate recommended. 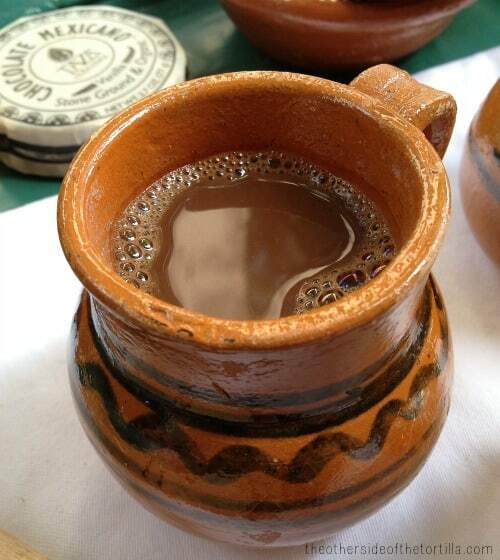 What’s your favorite twist on classic Mexican hot chocolate? This looks delish…AND…your blog is amazing! !…Just saying. I am totally creeping over here to ohhhh and ahhhhh it!! Oh the recipes! Thank you! My daughter and I always wanted to try a recipe like this!